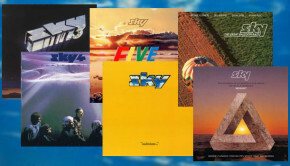 In 1979 I was just starting along my musical journey, mainly interested in soundtracks and classical music, the latter thanks to my Mother’s preferred listening, and Sky were a band that piqued my interest. I heard them on one of their numerous U.K. TV slots to support their debut album and being familiar with classical guitarist John Williams from the theme music to the film The Deer Hunter his inclusion in Sky immediately drew me to the band. And I liked what I heard. Sky were one of my earliest introductions to rock music and despite their sound generally remaining nearer to music that I was already familiar with the increased energy of the electric instruments was an exciting twist and an important step on the road to my subsequent listening so there is a lot to be thankful to them for. As well as Williams, I was immediately impressed by keyboardist Francis Monkman. It wasn’t until much later That I found out that he was a founder member of Curved Air. Add to this the rockier edge of bassist Herbie Flowers and guitarist Kevin Peek coupled with classical percussionist Tristan Fry and you get a group of musicians with more than enough talent to go round. Talent alone does not always make a good album but the debut is just that and gives a good overview of the band’s early sound. The first side is bookended by the stomping Westway and rocky Cannonball with a classically infused filling taking in Carillion with reinterpretations of Antonio Ruiz-Pipò’s La Danza and Erik Satie’s Gymnopedie No. 1. Throughout Williams’ beautiful guitar is at the centre of everything, Peek’s electric touches deployed for maximum effect, particularly on La Danza which starts as a spritely acoustic duet before the mood changes with electric riffing and harpsichord flourishes from Monkman. The second side makes the album, Monkman coming to the fore with his side-long 5-part suite Where Opposites Meet which adds jazz, fusion and modernistic elements to encapsulate what is good about Sky. It gets quite funky at times too and has stood the test of time quite well. As bonuses to the first album we get a sinister and compelling take on the medieval hymn Dies Irae with the B-side of that single release, March To The Scaffold from Symphonie Fantastique by Hector Berlioz. There’s also a very faithful live version of Where Opposites Meet recorded at a UNICEF concert at Wembley in November 1979 so all in all it’s a worthwhile selection of additional material. Working in the same era as The London Symphony Orchestra’s Hooked On Classics, Sky are today often written off for simply producing polite rock reinventions of famous classical themes, as in their biggest hit Toccata from the Sky 2 album, but this does not take into account the depth and skill that they brought to their early original material. Alongside their bravura side you also get the more faithful renditions that you would expect from the involvement of Williams plus the intricate compositions of Monkman. The aforementioned Sky 2 is my favourite of this pair of reissues, the extended double album running time allowing the band to cover a lot of ground in an at times thrilling listening experience. The rhythmic Hotta kicks things off with fine work from Fry, Monkman and Peek in particular. The pace changes with a sprightly Dance of the Little Fairies, Sahara bringing the old Side One to a close with an atmospheric sweep. With the first three numbers, packed with variety, collectively written by Flowers and Peek, Monkman again delivers the album’s centrepiece with the side long FIFO. His grungy guitar additions offer a new texture amongst the more precise tones and the four movements take in a number of different feels in what is a very proggy workout. The next block of songs are solo features. Flowers gets do do his tuba party piece in a live recording of Tuba Smarties, with Fry helping out on trumpet, before a trio of classical interpretations. Monkman gives a harpsichord masterclass on Rameau’s Gavotte and Variations, set between Williams and Peek duetting acoustically on Praetorius’ Ballet-Volta and Vivaldi’s Andante. Finally, Fry gets a turn with his tuned percussion on Tristan’s Magic Garden, a track that I appreciate more now than I used to. The classical pieces are simply beautiful and display that side of the players’ talents, the format allowing the space for them to be included. ‘Side Three’ closes with Williams’ El Cielo with the full band reassembled. The final run for the tape features the rockiest pieces, starting with a rollicking version of Darryl Way’s Vivaldi from Monkman’s time with Curved Air, guitars taking the violin part. Flowers’ lengthy Scipio is jaunty and pleasant, some of the sounds a little dated but overall it is good fun, and finally we get the track that most people would think of when remembering Sky, Toccata, a hit in a number of territories that brought the music of J.S. Bach to a wider audience. It is still an exciting piece but, unsurprisingly, not as groundbreaking or impressive as when it first emerged. No bonus tracks for Sky 2 but both albums come with bonus DVDs. The debut features around 30 minutes of BBC TV slots, all that survive apparently, including interviews and performances on daytime shows plus a video for Cannonball shown on The Old Grey Whistle Test and the opportunity to see genial Irish crooner Val Doonican sitting in with his guitar for a version of Carillion. The Sky 2 DVD is much better; almost an hour and a half of the band live in concert from Hammersmith Odeon, originally broadcast on the BBC in two parts in 1980, plus the band performing Toccata on Top of the Pops in front of a bemused gaggle of teens who really aren’t sure how to dance to it. Surely the most talented bunch ever to play on that particular show, the audience clearly can’t grasp what is going on. For the multi-camera live show, Williams is, as you would expect for a player of his stature, superb throughout and the sound generally centres on him but Peek is no classical guitar slouch either and the interludes where they duet are just sublime. FIFO works very well, the band clearly enjoying the extended workout, while at the other extreme we get Tuba Smarties, Flowers dressed as a gnome, his instrument decorated with fairy lights! The acoustic guitars are superbly integrated into the band’s sound which isn’t allowed to swamp them by getting too overblown. The rhythms can be a little pedestrian – again the word “polite” comes to mind – but the enthusiasm of the ensemble playing coupled with the precision of the more formal pieces is wonderful. All of the original material is melodic and highly listenable and Sky certainly hit on the ideal way to utilise the skills of their star turn whilst allowing everyone the chance to shine. Overall the sound is accessible and toe-tapping without much need to furrow the brow for intensely concentrated listening, possessing a definite likeability. Monkman adds a few savage edges via his harpsichord but the sound remains pretty mainstream. Monkman left Sky in 1980, Williams also leaving in 1984, but the band continued until 1995. 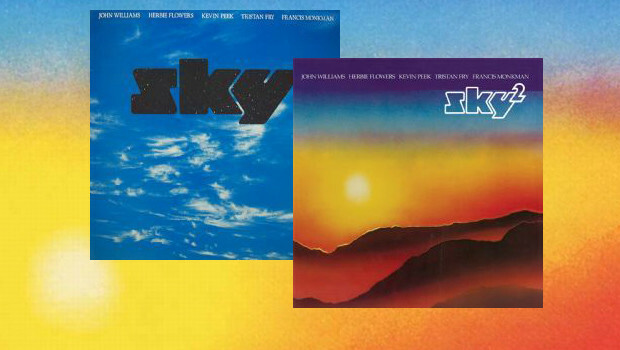 My dalliance with Sky only lasted a few years before being overtaken by other sounds that I was hearing for the first time and I have not listened to either of these albums in probably 25 years. It is great to hear them again and to know that they still retain their magic. It is also a surprise that some of the tracks that I had relegated or downplayed over the years now make the most impact, Where Opposites Meet being a prime example. As instrumental albums go these two show what can be achieved; dazzling musicianship brought to bear on original material and reinterpreted covers that underline what an important group Sky were. These remastered Esoteric reissues, with Sid Smith’s as always excellent liner notes drawn from an interview with Tristan Fry to add a first hand account, sound superb and are well worth acquiring to reacquaint yourself or hear afresh the wonderful music produced by this unexpected confluence of talents.